Our preschool area is colourful and exciting! It has the advantage of being in the close proximity of the messy area and access to our outside spaces. So because of its location, there is a ‘free flow’ between all the rooms and the great outdoors. As we focus on enriching our children’s experiences, we make hands on experiences our first priority; from organising trips into the local community where the children can have their own first encounters with the environment. At Katey’s Nursery & Pre-School we follow a set topic each term with integrated activities covering the seven areas of learning (Early Years Foundation Stage). The individual observations enable us to offer a personalised provision, so we can focus on specifically helping each child to get to his/her next particular developmental stage. The individuality of each child is also embraced by covering multi-cultural celebrations to enable the children to develop their own sense of identity and to respect each other’s cultures and show awareness of these. Every child is allocated a Key Person. The Key Person will be well aware of the developmental stage of each child and will be able to support parents in any inquiry they may have concerning their child. The progress of each child is stored in their individual Learning Journey, which parents are warmly encouraged to take home from time to time and to contribute to. Our children make use of our wonderful resources in a unique way and their creativity is valued and highly praised. The resources available are diverse including; musical instruments, card games, counting and alphabet games, water play, easel painting, sand play, unifix cubes, lotto games, money trays, weighing scales, dressing up as well as a large stock of toys and games, books, cars and roadways, trains and tracks, play people, dolls, farm and zoo animals, various construction bricks, jigsaws etc. Our Circle Times focus on enhancing the communication and language skills of the children. We use fun games to introduce sounds and letters and then we work alongside every child in reaching their next developmental milestone. Our provision is personal and every child is encouraged and praised for their specific contribution. We enjoy exploring the community around our nursery and we often visit places related to our current theme. The children are encouraged to reflect on their experiences and to make connections and associations. Our out of the setting trips are carefully planned and always enriched. 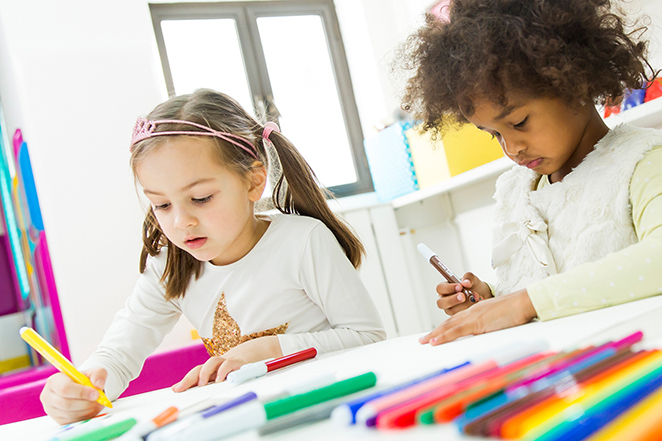 Before the child leaves our nursery to attend school, we contact the future school and develop a relationship so that the child can visit the school before attending it in the hope of facilitating a smooth and healthy transition for the child.